The 3rd-generation of Xiaomi’s Mi Laptop Air (or Mi Notebook Air, depending on where you buy the portable) has landed in a bid to outclass the growing legion of premium Windows laptops that aspire to be the best alternative to Apple’s MacBook Air or even the MacBook Pro. US online retailer, Newegg, sent us the Xiaomi Mi Laptop Air 13.3 sample, but doesn’t sell the notebook yet. Just bear in mind that the Air is all but a clone of these two aforementioned laptops, despite the name used. These machines come not only from established players (the Dell XPS 13, the HP Spectre 13 or the Lenovo Yoga 920) but also from up-and-coming vendors such as Microsoft with its Surface Book 2, Huawei (and its MateBook X) and – wait for it – even Honor with the MagicBook. So will Xiaomi manage to up the ante with the Mi Laptop Air 13.3 2018 edition? Let’s find out. Xiaomi used the same design for its Mi Laptop Air as the previous generation. Well, there’s no need to change a winning formula, plus the savings involved in not redesigning a new product can be passed on to customers (or indeed used to increase margins). There’s still no logo on the cover of the Laptop Air – you can find a stylized ‘MI’ logotype underneath the laptop, but that’s it. Xiaomi is still using the minimalist design which has become a signature feature: the laptop has a brushed metal finish, an all-metal enclosure, sharper-than-average edges and an evident disregard for super-thin designs. There are no visual tricks to shave a few millimeters off the spec sheet, and no tapered profile/wedge as seen on the MacBook Air. As with Apple laptops, there’s a chamfered cut and a centrally located hinge that links the base to the display. Flip the machine upside down and you’ll discover five rubber feet and six screws that keep the base together. The three grills for the downward-firing speakers are still present, which also facilitate cooling. The laptop is available in silver or dark gray colors, either with an Intel Core i7-8550U or Core i5-8250U, the two being identical except for the base/maximum CPU speed and processor cache. While the laptop has exactly the same dimensions as its predecessor, the 2018 version is ever so slightly lighter by about 20g, which allows it to dip below the 1.3kg mark (both models are shown next to each other in the above and below images – the lighter colored model is the 2017 incarnation of the notebook). The power supply unit still weighs 223g. Open the laptop and you will discover a sizeable display with an oleophobic glass overlay which encourages the user to touch the screen, only to be disappointed when nothing happens. No, the Air doesn’t do touch, which is sad to say the least. A matte finish would have been better. There are five ports in all. You’ve got an HDMI connector (a rarity on thin laptops), USB 3.0 port and earphone jack on one side, along with a USB 3.0 and USB Type-C on the other. The latter also doubles as the power port (so you can’t use it when plugged into the mains). There’s also a tiny status light that turns red when the PSU is plugged in to let you know that it’s charging. The aforementioned drop in weight compared to the predecessor model might be down to the fact that the battery used here is a tiny bit smaller (37Whr as opposed to 39.2Whr). The other main difference is the use of the newer Core i5-8250U processor which was announced last year, and has now been superseded by the 8265U which doesn’t bring much to the table other than a higher maximum turbo frequency. For the rest of the spec, the key components (memory, communications, graphics and system storage) remain the same. The PM961 NVMe SSD is still rapid enough for most tasks and even though it has been succeeded by the PM981, the differences between the two remain negligible (except in terms of random write speeds). The GeForce MX150 GPU is still there largely due to the fact that Nvidia hasn’t released a successor. Another option might have been to use the Ryzen 5 2500U with Vega 8 graphics, which other laptops like the Honor MagicBook have adopted, although you’d lose the extra dedicated 2GB GDDR5 memory. Note that there are two memory slots, one of which is populated by a lonely memory module. Performance can be boosted by adding another memory module to enable dual-channel bandwidth gains. This is the international version of the Xiaomi laptop which means that it has a proper international Windows 10 Home edition, which received relevant system and security updates without issues. Single-core performance was roughly on par with last year’s laptop which contains a 7th-generation Intel CPU with a much higher base frequency. Where the 2018 edition shone was in multi-core tests where the four cores delivered some cracking scores. The 13.3-inch Full HD IPS display is protected by glass made of sapphire and delivers bright, crisp pictures with good viewing angles and decent saturation levels. However, the glossy finish makes it near impossible to read in bright sunlight, which is a shame. Last year’s complaint about a noisy fan no longer holds as the device was relatively quiet during our benchmarks, only briefly firing up under taxing loads, partly due to a much lower CPU base clock speed and an upgraded cooling system. Battery life is below average at 4 hours 15 minutes, which is barely acceptable even for a laptop with a dedicated GPU – and notably less than half the 9.5 hours claimed by Xiaomi. Subjectively, the keyboard rates on a par with the likes of the Dell XPS 13. There’s less spacing between the chiclet keys but they are bigger (at 16mm) than the ones on the aforementioned Dell laptop. There’s a decent spring to the keys with good travel and no flex. As with its predecessor, the function keys on this laptop are about half the size of the normal alphabetical keys. The power button is located on the top right-hand side of the notebook. The keyboard is backlit but doesn’t offer a middling ‘medium’ light setting – it’s basically on or off. The touchpad is generously sized at 110 x 67mm – it has no physical button and comes with an integrated fingerprint scanner located on the top right. The fingerprint reader worked flawlessly and the sound quality of the four AKG speakers represents one of the better audio experiences we’ve heard on a thin-and-light laptop. Note that there’s no memory card slot which may put off some potential buyers. 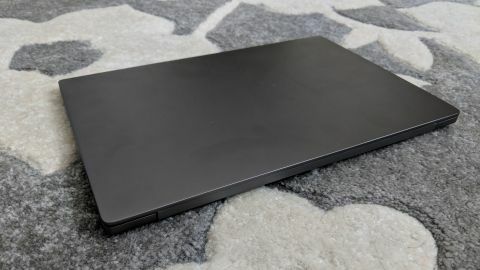 The international version of this laptop has yet to be sold outside of China at the time of writing, so we have to rely on the pricing of the likes of Gearbest where the laptop is on sale for $760 before any taxes that may be levied by HMRC or the courier companies on behalf of the vendor. So what alternatives currently exist? The HP Pavilion x360 14-cd0008na comes with the same CPU and a similar feature set minus the dedicated graphics card. You do get a touchscreen display, a convertible form factor, a card reader, a localized keyboard, a bigger battery and an optional 3-year care pack with pickup and return service. At just under £629 (around $820) at the time of writing, it is a better deal if you don’t need graphical grunt. The Lenovo IdeaPad 530S comes very close to the Mi Laptop Air, at least on paper. It has a slightly bigger form factor (14-inch display), tips the scales at a hefty 1.5kg, has an AMD Ryzen CPU with Vega 8 GPU, but it is also cheaper at £599 (around $780) and has a localized keyboard. At just £599 (around $780), the Dell Inspiron 13 5000 laptop adopts the same set of components as its main competitors but is pegged at a much lower price point. It doesn’t come with a fingerprint reader or a discrete GPU, although you will be able to upgrade the machine to a whopping 32GB of memory. Another alternative is the PC Specialist Lafite III. It has no discrete GPU but can be configured to your needs and budget via a simple drop-down menu. As such it doesn’t have the same level of integration as the Xiaomi Mi Laptop Air 13.3, but it is the only alternative here that can offer up to 32GB of memory with a 2TB SSD in a thin form factor – albeit at a cost. Should businesses buy the Xiaomi Mi Laptop Air 13.3 (2018) laptop? It is worth noting that this laptop was launched at the beginning of the year in China and has only just been released globally, with wider availability likely to be coming towards Black Friday 2018. As with its predecessor, the Xiaomi Mi Laptop Air 13.3 (2018) is not intrinsically a bad product. Yes, one might question the benefit of adding a dedicated graphics card to a laptop that’s not gaming oriented. The same goes for the debatable addition of a glossy glass overlay on a screen that’s not supposed to be touched. Other than that, the only deal-breaker for us remains the poor battery life, which at less than five hours is far from what we’ve come to expect in the world of premium laptops. Business users will appreciate the conservative design of the notebook which is devoid of any flashy elements. Also worth mentioning is the fingerprint reader, as well as the quality of the keyboard, which, once we’d got used to the Enter key, proved to be quite a hit.